Most of us don’t check our credit scores as often as we should, but someone else is more than likely looking at it for you. If you’ve applied for any type of loan (or even got a credit card offer in the mail), someone else has looked at your credit score. They wanted to determine how much you could borrow and how much to charge you for it. Despite how much our credit scores affect our lives, they’re a bit elusive. One month your score is thirty points up, and the next month it’s twenty points down. So what makes up your credit score? And how can you work to improve it? More often than not, the phrase “credit score” refers to your FICO score. The three main credit agencies look at all of your credit accounts and all of the payments you’ve made. Your credit cards (even store accounts), mortgages, and car loans are all fair game. Then, you’re given a FICO score based on those three credit reports. Your score ranges anywhere from 300 to 850, and higher scores indicate better credit. 35% is based on your payment history And they dig deep—you could even find unpaid medical and library bills here. Potential creditors want to see that you pay your bills on time all the time. It means that they don’t have to worry about never seeing their money again. 30% is based on the amount of debt you have More specifically, it’s based on the amount of debt you have in comparison to your credit limit. Creditors view maxed-out cards as a sign of bad money-management. So having $500 charged on a card with a $1,000 limit actually hurts you less than having $500 charged on a card with a $500 limit. 15% is based on the length of your credit history The longer you have credit without going bankrupt, the more creditors trust you. The length of time you’ve had each credit account (and how long it’s been since you’ve used them) impacts your credit score. The older your accounts are, the better your score will be. 10% is based on how many new accounts you have Creditors view opening new credit accounts very quickly as a sign of someone risky. If you have just one credit card and suddenly apply for five more, it probably means you’re tight on cash. The less often you apply for new credit, the better. 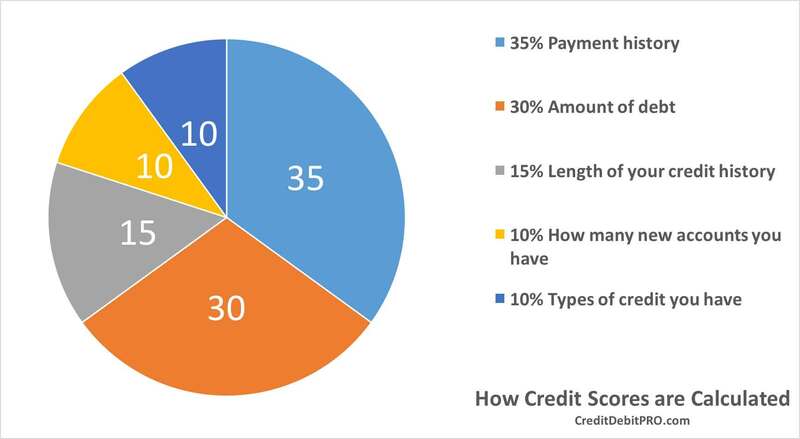 10% is determined by the types of credit you have It’s good to have multiple types of credit. It tells creditors that you’re mature, can handle several types of debt, and are at a steady point in your life. Having installment debt that you pay monthly (like a mortgage or car loan) in addition to revolving debt (like credit cards) will improve your score. First things first, credit bureaus are companies that collect and maintain your credit information to sell it to other companies in the form of credit reports. There are three major credit score bureaus: Equifax, Experian, and TransUnion. While each credit bureau gives you a credit score, the score you most often here about is your FICO Credit Score (which we’ll explain soon). Your score from credit bureau to credit bureaus will often differ. The three major credit bureaus are independent businesses and don’t share your account information with each other. You may have on credit card that reports to just one bureau and another that reports to two or three. As a result, the information each bureau gets is slightly varied, which causes the differences in your three scores. Sometimes, that information can differ so much that you have scores that aren’t even comparable. That’s when your FICO Credit Score comes in handy—it regulates your credit score across the board. FICO is an independent company that works with all three major bureaus to develop individual FICO credit scores. These scores focus on the factors listed above, and help to regulate your credit score across the board. As a result, your FICO score is a more accurate picture of your credit, whereas your credit scores from each bureau may be skewed based on the information they have. It shouldn’t come as a surprise that credit scores tend to go up as you get older. The older you are, the more money you’re bound to have. A twenty-one-year-old who is barely making ends meet can’t be expected to pay their bills at the same rate as an employed fifty-year-old (and it doesn’t hurt that the fifty-year-old has a long credit history). Of course, those numbers probably don’t mean anything to you. And your score may not fit the average for your age group. That’s why it’s important to understand what scores on all ends of the spectrum mean. This is the lowest credit score range. Only 16% of Americans have scores that fall in this range, and it can be tough to bring such a low score up. Creditors will not consider you trustworthy, and you’ll likely only qualify for secured credit cards. However, you can bring your score up significantly over the course of several years (and slightly in just a few months). A score between 550 and 649 points is slightly below the national average of 660. A credit score this low tells lenders that you’ve made some serious mistakes and aren’t too trustworthy. Many will be hesitant to lend you money, and those who do will charge you very high interest rates. Around 20% of Americans fall into this credit score range. A credit score between 650 and 799 points is considered good. The national average is around 660 points, so the higher you get in this bracket, the closer you are to an excellent score. Your credit report is likely affected by a few small mistakes, but lenders will still assume you’re a trustworthy borrower. You’ll get average interest rates, and likely won’t run into trouble getting loans or new cards. A credit score between 800 and 850 points on the FICO scale puts you at the top 18 percent of the population. It’s considered an excellent credit score, and tells lenders that you’re a low-risk borrower (meaning they can definitely count on you making payments). When your credit score is this high, you’ll get offered the best interest rates. At this point, you know how a credit score is determined and what different credit scores mean to lenders. While that’s great, we should discuss what you’re really here for: improving your current credit score. But I promise everything else wasn’t in vain—knowing how your credit score is determined helps you build a strategy to improve it. Make sure you pay your bills on time. Even if you pay a bill only a few days late, it can have a major effect on your credit score. Even if you pay a collection, it stays on your report for seven years. Your lenders will report any late payments because they send the message that you aren’t on top of your debt. Take care of missed payments as soon as you can. Your newer credit history matters more than your old credit history—if you take care of all of your overdue payments and start paying on time, you’ll see your score go up. If taking care of your old debt is difficult, consider consolidating your debt. If you feel you are being harassed or were harassed by debt collection agency, we can help you. Read our article about unfair debt collection. Pay more than your minimum payment. Having a lot of debt—even if you always make your minimum payments on time—can hurt your credit score. The closer your balance is to zero, the better your credit score will be. Ideally, you shouldn’t have more than 30% of your credit line charged at the end of the month. Don’t close unused cards to raise your score. Your FICO score is based on the amount of debt you have in comparison to the size of your credit line. Having multiple credit cards—even if they’re unused—will lower your debt to credit ratio, making your score go up. Don’t open up new accounts to raise your score. Even though a larger debt to credit ratio will help your score, opening new accounts will hurt it. It’s not worth the risk. If you’re looking for a car or house, rate shop at the same time. Searching for new credit—even if you don’t apply for it—will have a negative impact on your credit score. However, FICO will group similar credit inquiries in a short period of time. The idea is that people who are looking for the best car or home loan won’t be punished for shopping around. Only open new cards if it’s wise. Depending on your situation, opening a new credit line could be a good option. It will lower your debt to credit ratio, and give you another chance to make regular payments on time. However, don’t take the decision lightly. Don’t be hesitant to check your own credit report. Even though credit inquiries lower your credit score, checking your own credit report will have no effect on your score. In fact, it could help you improve your score by learning where you’re falling short. Don’t open new accounts just to diversify your credit. Even though a diverse mix of credit types will raise your score, the negative effects of opening new credit will cancel the benefits out. But don’t give up credit cards entirely. It seems like a good idea to cut up your credit cards and never look at them again. However, someone who doesn’t have credit cards poses a higher risk to lenders than someone who uses them responsibly. Potential lenders want proof that you’re mature enough to handle debt. Remember that closing your accounts doesn’t matter. Even if you close your account, it will still show up on your credit report. which means it can still affect your score. So it may be better to leave it open to demonstrate a diverse credit mix.